In the hot summer months, a staggering 40% – 60% of domestic water consumption is attributed to outdoor uses, such as watering lawns and gardens. Reducing outdoor water use can have a noticeable impact on your water bill, and make a positive contribution to water conservation efforts advocated by most municipalities. 1. Many irrigation systems were set up with little consideration of water conservation. Each irrigation “zone” should be set up to reflect the water demand for that particular area of your property. For example, the lawn on a southwest facing slope will often require twice as much water as grass on the north side of the property. Elevated areas may require more water, whereas low-lying areas may retain water more efficiently and will require much less water to thrive. Assess how your lawn irrigation system has been set up and timed, to determine if you can make simple adjustments to minimize water usage. 2. Install drip irrigation for shrubs and flower beds. Water usage for these areas can be reduced by 50% by properly installing drip irrigation. 3. 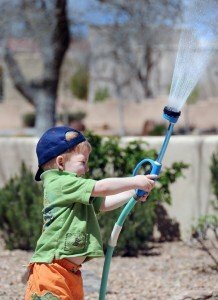 Make sure your irrigation system is set to water in the evening or early morning hours, to maximize the amount of water your plants can actually use, vs. watering in the hot sun when much of the water will evaporate. 4. If you want to take it to the next level, do your research and choose plants and grass that require less water to thrive, vs. their more water-thirsty counterparts. One final note: Xeriscaping for minimal water use is a desireable option, but be careful. If you remove all vegetation and replace it with rock, it will absorb heat from the sun and heat up the surrounding area.